I love these little notes from the Universe. You don’t have to take everything so seriously, Lois. Life isn’t black and white, answers aren’t always yes or no, and absolutely nothing has to happen today. Act when you’re ready. Be led by your feelings. And the next time someone wants to fit you into a mold, just tell ’em that your jeans are in the wash, your angels are at the mall, and Oprah’s on the other line. I think the Universe sent this note special just for me today because I take everything seriously. It’s all black and white. And if it isn’t happening today right now, it’s never going to happen. Reading this list, I see both positive and negative traits and some that could go either way, and I definitely see myself, too. I’m usually where I say I’m going to be, when I say I’m going to be there. I’m detail-oriented. I want my car to run good, my food to taste good, my body to work good. I want my days to be full of fun adventures. I’ve worked on being less controlling as I’ve gotten older but in my younger years, I wanted everything to be the way I wanted it to be. I’m not sure anyone would ever call me “cautious,” though. I thrive on communication, the verbal kind, and when it doesn’t happen, I make stuff up in my head. I make up stories about why someone is the way they are, about why what happened just happened, and of course, it’s all related to my own story. I have no way of actually knowing what makes another person tick or why that thing just happened unless someone tells me. Of course, when they do tell me, whatever story I’m making up is not even close to the truth. And I’m a slow learner. A very slow learner. It can take me a really long time to learn some things. I want to know what’s going on, what someone is thinking, why they’re acting the way they are, what’s wrong. I also want to know what’s right, what someone thinks about a topic, what makes them tick. I want to know their stories. And I feel like having a 2-year-old’s temper tantrum when I think I’m being shut out. I want to be patient, kind and considerate, not angry and resentful. I want to rise above the negativity that seems to wander around the edges of everything these days, including my own thoughts. I’m bigger than that small stuff. We all are. I want to be around other people who are trying to be better people, who want to live their own lives authentically, who are considerate of others, who take responsibility for the way they live their lives. 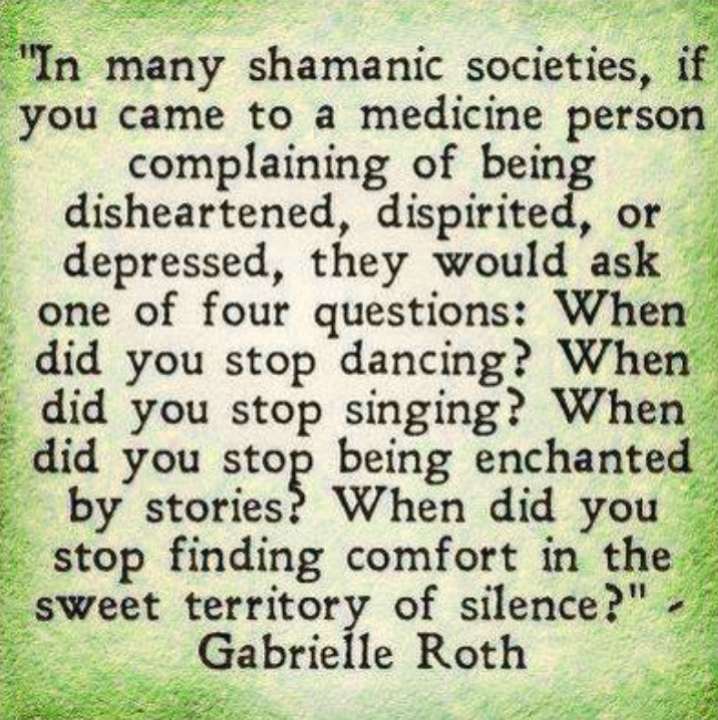 I know that when we tell our stories, when we dance, when we sing, we’ll be happier and healthier. In my own quest for a healthy and well body, mind and spirit, I’m committing to doing more dancing and singing, to telling more of my own stories, to being around others who want to do the same thing. I hope you’ll join me in my quest for a better life, for a better world. Let’s surround ourselves with fun and adventure, laughter and music, and other people who want the same thing. I think it’s sometimes hard to tell our own stories without making it sound like we’re blaming someone else for something that happened when it’s really just stuff that happened and it’s really just our own stories. I’ve sometimes hesitated telling the specifics of my stories because it’s just my story as it currently flows in my head, and it is just what it is. Some day, I want to let it go, all of it, and I’ve read that owning my stories is the first step in doing that. I think when I’m comfortable with my own stories, I’ll be comfortable with whoever I am, wherever I am. So for now, I’m acting when I’m ready, and oh yeah, I’m telling my own self that my jeans are in the wash and my angels are at the mall. *Click here to sign up for TUT’s Messages from the Universe. I’m not a part of TUT in any way except that I enjoy the emails that come every morning. ← I have no idea what I’m doing… I don’t even know what an API is. Very cool Lois. Great insight and love the message from tut.com for you today. I just might have to try it myself! Wow no wonder we get along so well! First born huh? I tried to sign up for TUT bit it wouldn’t accept my email address. Oh well I tried. Why wouldn’t it take your email? maybe you signed up before and it wouldn’t let you sign up twice with the same email? Weird. No it said my email address was not valid. That’s weird! Your email is valid everywhere else! Maybe there was a typo? Did you try it more than once? Oh my that Roth Quote was spot on! Thanks for sharing that. I feel like I’m good..as long as I’m good…and then when I’m not good…I’ll appreciate the good. I signed up. Looking forward to some fresh thoughts. p.s. I’m the middle child — a tough place to be. Hi Nancy! I love getting the little note in my inbox every morning – always something nice and positive! I read the middle child synopsis and yes, I agree, it sounds like a tough place to be. Seems like every birth position has issues 😀 Even the only child position!